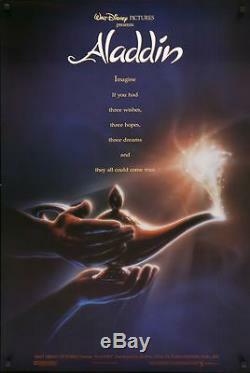 Poster Information - Aladdin - 1992. Rolled - Double sided for backlighting. Excellent/Near Mint+ unused condition - poster has never been hung. Poster is wrapped prior to be putting in the tube and then both ends of the tube will be padded. Please be aware any one-sheet that is not 27" x 40" or 27" x 41" is more than likely a poster of these types (24x36 is the most common size of reprint). While some of these may end up being collectible, at this time there is a very limited market for these items. If any reader ever has any questions please feel free to <>contact me. The item "Aladdin original DS movie poster D/S 27x41 Disney Animation Adv John Alvin" is in sale since Tuesday, January 15, 2019. This item is in the category "Entertainment Memorabilia\Movie Memorabilia\Posters\Originals-United States\1990-99". The seller is "ddilts399" and is located in Cedar Rapids, IA. This item can be shipped worldwide.